Snow would be an incredible novelty in my part of the world (coastal Southern California) so, other than worrying about the damage it would do to my succulents and other plants suited to a Mediterranean climate, I’d fully enjoy it, assuming of course it didn’t hang around for long. The closest we’ve come in our current location is one brief round of light hail. I hope warmer days are in your near-term forecast. I grew up a few hundred miles north of you, and still tend to think of that climate as normal, though I’ve lived with regular snow longer than I was on the west coast, now. Once it gets cold, I’d rather it stayed that way than go back and forth across the freezing line. 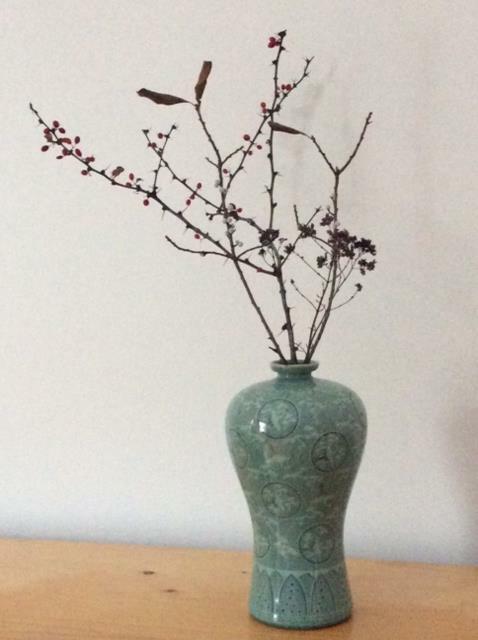 The vase is such a pretty shape and looks so elegant with the twiggy contents – thanks for sharing it with us today and hopefully see you next Monday too! I hate snow, but I live here because of work, so have to make the best of it. Reading about other people’s gardens cheers me up in the winter. Good luck with current frozenness! It’s a pretty vase & dried flowers.